Across our operations we want a work environment in which safety is deeply embedded in our culture. This is guided by our long standing principle that "our work is never so urgent or important that we cannot take time to do it safely and in an environmentally responsible manner." Process safety is achieved by using special precautions, or barriers, to keep our facilities safe and our products in the pipe, eliminating potential impact to people, property or the environment. This includes the prevention, control and mitigation of unintentional releases of hazardous material or energy from containment. It’s imperative that all employees understand the importance of process safety, and that consistent practices and processes are embedded with our work systems to prevent process safety events. Our Process Safety Strategy is helping us to provide structure to existing processes and programs and focus on training, communication, standards and governance. By providing an expanded process safety audit protocol, participating in targeted operational reviews, and performing Life Saving Rules verification, compliance will be ensured to help drive better process safety performance. A metrics procedure for reporting of near miss and process safety metrics drives a greater focus on reporting leading metrics. Ongoing monitoring of our process safety performance through structured data reviews helps to identify trends and commonalities among process safety events to highlight areas of focus. Operations Excellence (OE) is a systematic and collaborative approach to enabling safe, reliable and efficient operations. It provides the tools to identify and turn opportunities into realized improvements. The approach recognizes the operational and business challenges inherent in our global business. OE's methodology is aimed at striking the optimal balance between the discipline gained from structured global processes and the quick decision making and personal ownership derived from an experienced-based organization. Operations Excellence provides the platform for the retention and sharing of corporate knowledge that is critical to our future success. It establishes a common language and approach that drives consistency in performance across the company. Be an industry leader in Health, Safety and Environment and Asset and Operating Integrity. Deliver on long-range plan commitments. To improve operational performance and deliver a sustainable competitive advantage. Reduce risk: A comprehensive risk management process can prevent the occurrence and mitigate the consequences of major incidents. Leadership and Management; Planning and Scheduling; Human Performance; Asset and Operating Integrity (including Process Safety); and Maintenance and Reliability programs contribute to the prevention of serious incidents. The OE systems are designed to minimize the potential for HSE impacts and maximize operating reliability. Improve base production: On any given day, we produce more than a million barrels of oil equivalent production per day from existing sources, so even small improvement in production can significantly impact the company's bottom line. Ensure operability: It is essential that projects come on stream and perform as premised in the basis of design. For this reason, it is critical that learning from operations is fed back into project design and construction. In order to achieve these objectives, ConocoPhillips has developed a systematic approach to delivering sustainable improvements. 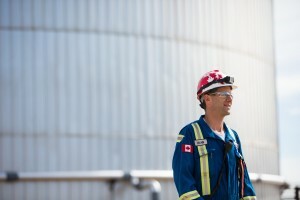 We invest significant resources and provide focused attention to continually improve our process safety culture and performance across the entire company. Process safety refers to the control of process hazards in a facility with the potential to impact people, property or the environment. This includes the prevention, control and mitigation of unintentional releases of hazardous material or energy from primary containment. Have defined safety roles and responsibilities at all levels. Serve as employee representatives on joint health and safety committees. Participate in analyses that identify process hazards together with their control and mitigation measures or barriers. Provide operator input and exhibit ownership of process startup/shutdown procedures and emergency procedures. Participate in safety qualification and training programs. Are empowered with the right and responsibility to stop unsafe work. Perform work permitting and pre-job hazard analysis. Participate in safety, technical and procedural reviews, incident investigations, audits and emergency response teams. Process safety performance is continuously tracked to monitor strengths and assess opportunities for improvement across key business areas. This monitoring includes a strong emphasis on process safety auditing to validate and support metric data. We have adopted additional process safety metrics across key business sectors beginning in 2011 based on the American Petroleum Institute (API) Recommended Practice (RP) 754 “Process Safety Performance Indicators for Refining and Petrochemical Industries,” and on the International Association of Oil & Gas Producers (OGP) “Asset Integrity – Key Performance Indicators.” These metrics are intended to provide management with additional tools to evaluate the effectiveness of our risk control barriers in preventing or mitigating unplanned losses of containment. Analysis of metric results helps direct specific improvement measures, which may include changes in engineering design, operating and maintenance procedures, and training opportunities.